The geological characteristics of the south of Menorca have propitiated the formation of great furrows excavated by water, with walls up to 40 m high. The Algendar Gorge is the most important and constitutes one of the richest and most varied ecosystems on the island. 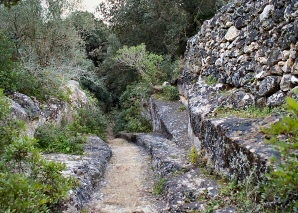 The water course, situated between the municipalities of Ciutadella and Ferreries, has its source on the Puig de Santa Magdalena and its estuary in Cala Galdana. Water flows all year and that humidity plus the protection against wind supplied by the walls of the gorge favour an exuberant wild flora and very fertile smallholdings. The surrounding fauna is also spectacular, particularly the Egyptian vultures (Neophron percnopterus), the booted eagles (Hieraaetus pennatus) and other birds of prey. In one of the caves in the gorge, the Cova des Càrritx, ancient archeological remains have been found that have provided important information on the characteristics and lives of the first humans who inhabitated the island. At the same time, the mysterious atmosphere of the area has given rise to numerous legends, such as "The White Partridge" or "The Bride of Algendar". In fact Algendar is a symbol of Ferreries folklore. The gorge can be reached from both Ciutadella and Ferreries. From Ciutadella you must follow the Camí Vell or Camí Reial, passing by Torre Trencada and continuing along the left fork, as far as Son Guillem, and from there walking down the ancient path that in part preserves the original paving. Starting from Ferreries there are several routes: you can follow the Camí Real towards Ciutadella, or take the rural lane the permits vehicle access as far as the very entrance to the gorge.